Where does the time go? We will finish Sitting Pretty by CBK next weekend and I have totally forgotten to post the next mystery class. Where is my mind? 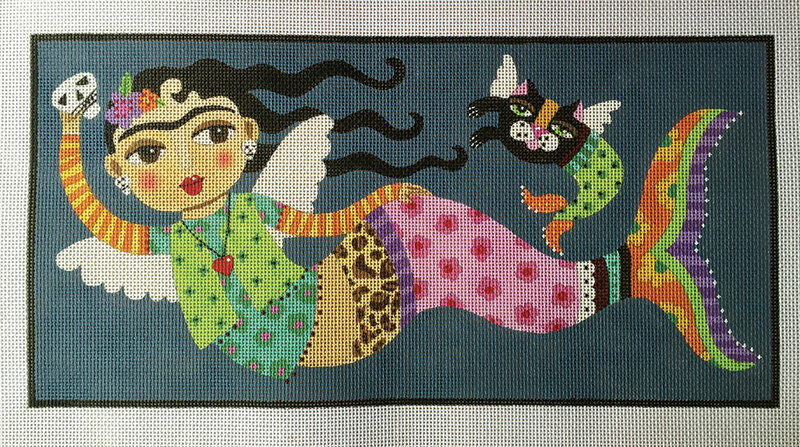 Our next mystery starting at the end of this month is Lulu’s La Sirena! Is this not just the cutest canvas ever? I’ve been itching to do a mystery class with a lulu canvas and now is the time. This one is perfect. 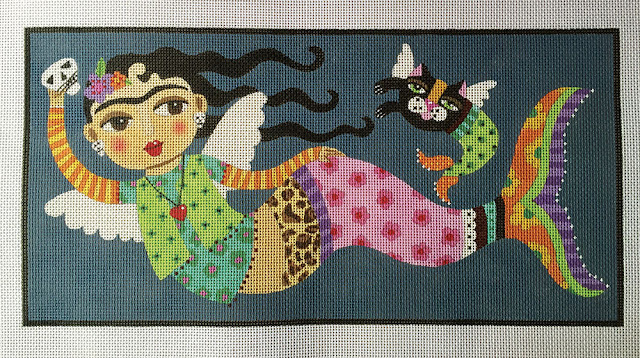 It has lots of pattern and is perfect for all my mermaid and cat lovers, not to mention those who love day of the dead. The mercat cracks me up! Classes will be June 28, July 19 and August 9th; Sunday afternoons from 1-3pm at the shop if you are joining us in person. You may also sign up for this mystery long distance and have us send it to you in installments. Canvas design area is 6 x 12 handpainted on 18ct. Class cost is the price of the canvas plus $15 per lesson and the threads, beads etc. necessary for that lesson. The canvas cost for this design is $152.00. You will need 10 x 16 stretcher bars. *Class size is limited. Please sign up early to reserve your space and ensure you receive your canvas in time to start with the rest of the class. An $80 non refundable deposit will be required. Balance due at the first class. We are pleased to be offering exclusive, limited edition snap trays to match the canvas. Keep your threads and stitchy supplies in your tray while working on the project. It’s guaranteed to be a perfect companion to the class piece. The snap trays are an additional $48.00. These are limited only to the students in the class. Once the class is over, they will not be available. They are an optional purchase so you don’t have to order one, but I know you are going to want to 🙂 The design is a surprise and won’t be unveiled until the first class. Give us a call at 410.296.0405 to register or sign up on line. Hope you see you in class.